TWO LARGE WORK SURFACES: Each Techtonic Electric Standing Desk includes a huge keyboard tray and top shelf, which adds more than 6.5 sq. ft. of extra space to your work area. That's more than enough room for a keyboard, mouse, notepad, laptop, coffee, pens, and more. Plus the integrated monitor arms suspend your screens above the desktop, creating even more usable space! VESA COMPATIBLE TRIPLE MONITOR MOUNT: The integrated triple monitor arm delivers easy, bolt-on attachment to most computer monitors. Not sure if your monitors are VESA compatible? No worries! Check out our photos to see if VESA works with your monitor. BOLD STANDING DESK: The big, multi-level surface desk you've been looking for! Ready to shake things up? Want to STAND out? What are you waiting for? This sit to stand desk is HUGE and has plenty of room to spread out your work. 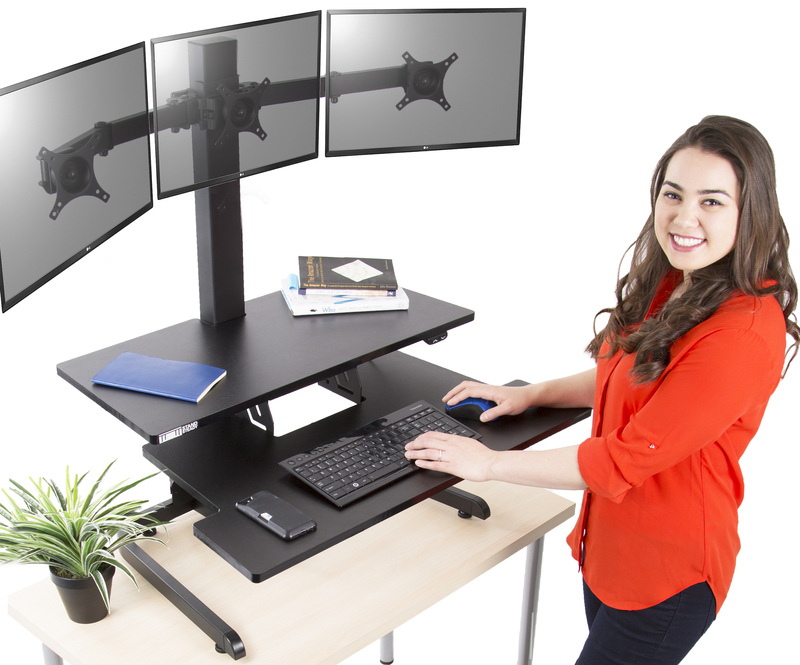 Start standing with the Techtonic Standing Desk by Stand Steady - TODAY! Easy Sit or Stand with a Push of a Button - Standing is proven beneficial for your work day by increasing your energy, productivity, and mood. This desk is great! It is massive, but holds 3 monitors and works wonderfully. I received this just last week as a gift from my boss because I work long hours and have back problems. I also have large 24" monitors and I am too spoiled downgrade! I recently purchased a wall mount tv and it came with extra extension arms. I added these to the 2 outside mounts and was able to spread them far enough out to put all 3 monitors side by side. It would be nice if they made these bars long enough to do the job without rigging it myself. The desk is made for high tech people, I don't know anyone that would have 3 monitors that were only 19' each. It is definitely well built enough to handle it! Our only remaining problem is the fact that everyone else in the office wants one too! But we will wait until we can find one that holds 3 24" monitors! Great desk. Only problem- the sides don’t extend so I had to adjust the monitors which I don’t like the way they are. Add an extender for the monitors. The desk has been working great and we love the triple monitor arm. We definitely plan to be a return customer. We only have tested one Stand Steady and works great for the 3 monitors. But we are unable to install a larger monitor in the middle. Would be nice if the monitor sizes were flexible. Thank you!! My co-worker loves the standing desk! We just wish it held a little bigger monitors. All else is great! 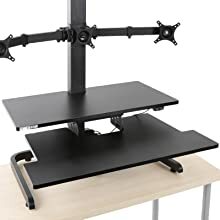 Techtonic electric triple monitor mount standing desk converter - NOW Holds 24" Monitors! Looking for a way to be more active? Even just the smallest step – or stand – can help reach your goals! Standing at your new Stand Steady desk can burn an extra 54 calories a day. With two large surfaces, you can spread out and work ergonomically! Plus, by mounting your monitors, you gain another level and free up tons of space. Save goodbye to neck pain and hello to more desk space! With easy-to-use electric adjustability, you can set this desk to your perfect height! That means you will lengthen your back and neck, improving your posture and ending your sitting pain! Standing at work is proven to be beneficial for your work day by increasing your energy, productivity, and mood. So, we made it as easy as a push of a button, start standing today! 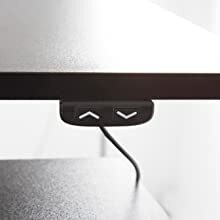 Easy to Attach VESA Mount(s) - Simply screw your monitor onto the mount, plug in, and you are ready to go! 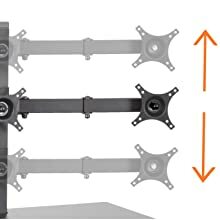 Your monitors will stay securely attached, while effortlessly rotating and pivoting. Set to your perfect height! Easily slide them higher or lower to line up with your eyes. Everybody doesn't have the same proportions so every standing desk shouldn't either! With two large surface areas, the possibilities are endless! Use the extra space to write notes, drink coffee, keep your snack within grabbing distance, and more! CRAZY Tall – Up to 44"! Lower Shelf Height Range 1 - 17.5"
Upper Shelf Height Range 5 – 22"
Monitor Mount Height Range 26.5 – 44"
Lower Shelf Size 34" x 18"
Upper Shelf Size 33" x 14"
We STAND behind our desks and our customers because we have your back. 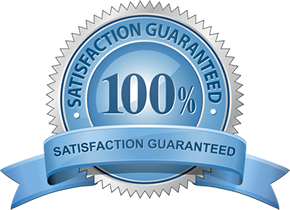 Take the guess work out of online shopping with Stand Steady 100% Satisfaction Guarantee! "The desk has been working great and we love the triple monitor arm. We definitely plan to be a return customer." "Good quality desk. I'm about 6'3" and it works perfect for my height.I really like the desk so far. I also like the fact that it can be moved to various heights." "It is very easy to use, quiet and was adjustable to fit their different size requirements. I will be buying more of these units in the future." and the motor is a piece of cake!" "Easy to install, sturdy construction, holds more weight than most competitive brands at nearly half the price, plenty of space for the keyboard & mouse!" "Fits my workspace and me perfectly! It adjusts to the height I need, and my screens fit on it and I have space for work papers too. " Looking for something a little different? 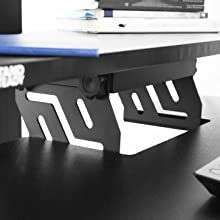 Check out more Monitor Mount Standing Desks!